Dan Reckard — Laguna Beach Live! Dan Reckard is a Los Angeles based saxophonist, pianist, and composer who recently graduated from the University of Southern California. Growing up in Laguna Beach and attending the Orange County High School of the Arts, Dan has worked in a variety of music styles, from classical to musical theater to popular music. During his time at USC, grew a love for arranging and directing music. He served as music director for a university-wide event called “From Bebop to Doo-Wop to Hip Hop,” which featured Motown composer, Lamont Dozier, and the late jazz legend, James Moody. Reckard also organized a benefit concert in Laguna Beach in May of 2010, called “Green Blues: A Night of Modern Jazz with Dan Reckard,” which featured Reckard’s original compositions for a large jazz ensemble with a string quartet. Reckard also serves as the Music Director for the Theme and Entertainment Awards, the annual gala for amusement parks worldwide. Dan’s group, Bossa Zuzu, draws inspiration from the time he spent in Bahia, Brazil. 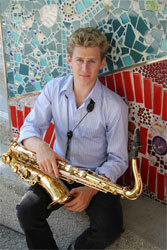 Bossa Zuzu features Dan on saxophone, José Gurrias on percussion and Capital on guitar and vocals. The trio plays everything from recent popular Brazilian music and original compositions to reinterpretations of classic Bossa Nova songs, always with a warm and intimate sound.